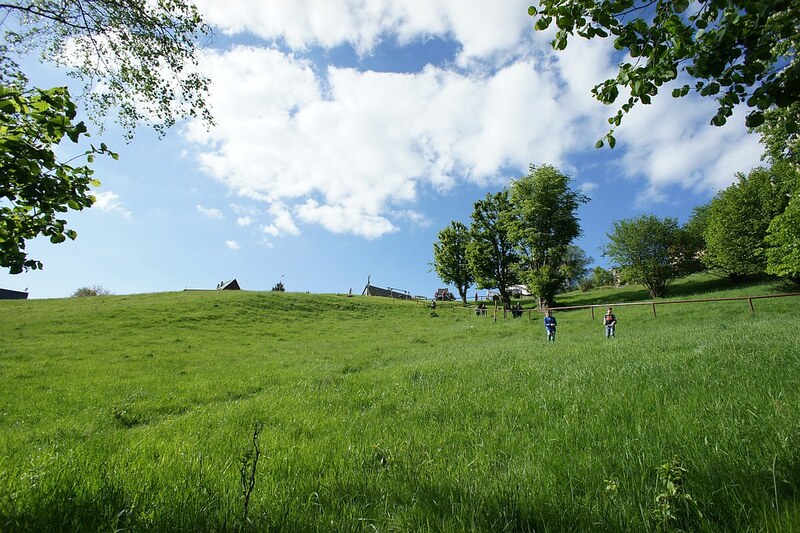 The winner of Challenge #57::" So Green Is My Valley-2015" is Peter with his "Caledon Country". Thank you everyone for your photo entries. I hope I was fair enough in arriving to my final decision. And I hope I offended nobody with my approach to evaluate these great entries. We had some brilliant entries! Thanks ever so much everyone! "In geology, a valley or dale is a depression that is longer than it is wide. The terms U-shaped and V-shaped are descriptive terms of geography to characterize the form of valleys. Most valleys belong to one of these two main types or a mixture of them, (at least) with respect of the cross section of the slopes or hillsides." We had 15 unmistakably green entries that each provided a good example for the definition of valley formations. Since "green" is not what was missing from the images, my reviews and evaluations had to address the more technical aspects of the photo frames. For the first time, for this challenge, I created "frame-estate-usage" frames with grids**. If you study each image, you'll find that the grid lines were placed to separate certain elements the photos comprised of / displayed. This was done to study how efficiently you used the frame estate to tell the story of your valley. Of course, this approach of mine is subject to discussion or dispute and we'd be happy to hear your views for or against this particular approach. **Grids are supposed to help identify; which elements in the photo were obstructive and taking away from precious valley space; if the frame was unnecessarily segmented or depleted; if the photo featured enough layers to tell the tale of a valley; etc. ***Disclaimer: The depiction of photos with grids which I created separately will be removed eventually. I hope the photo copyright holders do not perceive this as a violation of their rights or disrespect to themselves and their hard work. Peter chose a good vantage point to shoot this "green valley" shot. The piece of land he selected comprises of several interwoven small valleys, differing in depth and height, which are consequently bordered by higher land to the upper right of the frame (9). Going by the long shadows of the trees, the photo was either shot early in the morning or at sunset. The photo frame features a variety of natural elements that are spaced evenly and sparsely over the landscape, hence the photo estate. No one element overshadows or obstructs another but to the contrary, helps leave sufficient room for observing the other neat features that occupy the valley. The dirt road that meanderingly crosses the interwoven valleys, starts from lower left corner, bends and turns to visit almost all grid areas of the frame, until finally fading out of sight at the top of a hill. Peter has chosen/positioned the starting and the ending of the dirt road so smartly that, if the viewer's eyes follow the winding road's route, starting from bottom left, he/she eventually ends up viewing all the neat details of geology that the valley is comprised of. Characteristic layers created by Light and Colours: The sunlight that washes the foreground creates a fresh, bright green, voluptuously curvy downhill land, which later as the eyes move up, become cascaded by narrower land features that have turned grey-blue for the rain that prevails uphill: the colours and weather conditions help create visible layers that add depth to the overall frame. Very nice, Peter. Thank you for your contribution. Great picture and expert Photoshop edit, there seems to be quite a bit of UV over the distant hills but more probably shadow. Marcell Nicolausz joins our challenge with a green site in his hometown which has lovely silver blades bending obediently to the wind. 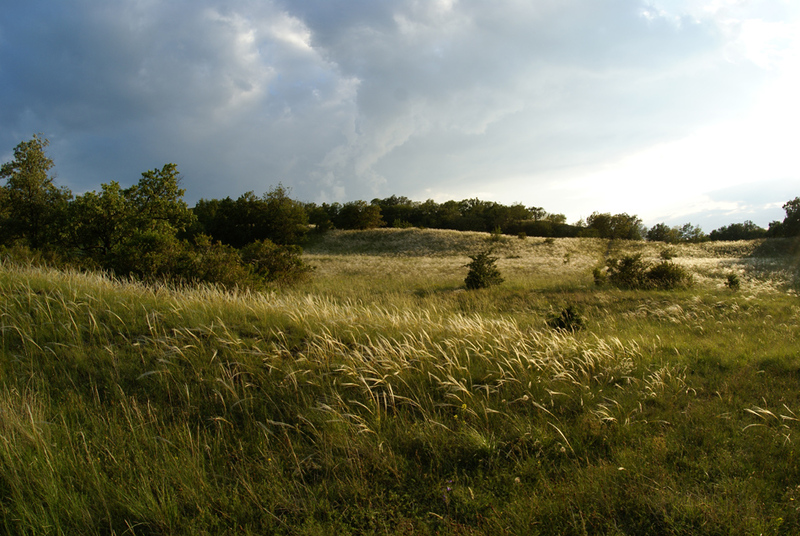 The photo only has 2 horizontal grid lines that separate the frame into 3 horizontal segments: the foreground with grass; the middle zone where shrubs begin to appear; and the line of green shrubs that grow in the distance, finally giving way to a blue sky. There are no vertical grid lines because there are not many significant geological phenomena to emphasize. The green site is too small an area to call a valley on its own. In reality it might be a part of a bigger valley that meets the definition of the word but unfortunately we don't see that in the photo. The scene lacks more depth, layers and interacting geological features. A wider angle which also accommodates more valley-like geological land features would have made a real difference. But, the untouched, unaltered wild growth that makes up this site is precious with no sign of human dominance or existence. The site is promising, if only you had chosen a better vantage point and taken a different approach with wider angles. Marcell, thank you for your contribution. It's a lovely photo but has some major shortcomings for this particular challenge. Don't let this review discourage you and please keep on shooting photos to your delight! And please make sure you still enjoy the premises of the forum and/or challenges and don't forget us! D) We eternally enjoy your photos. 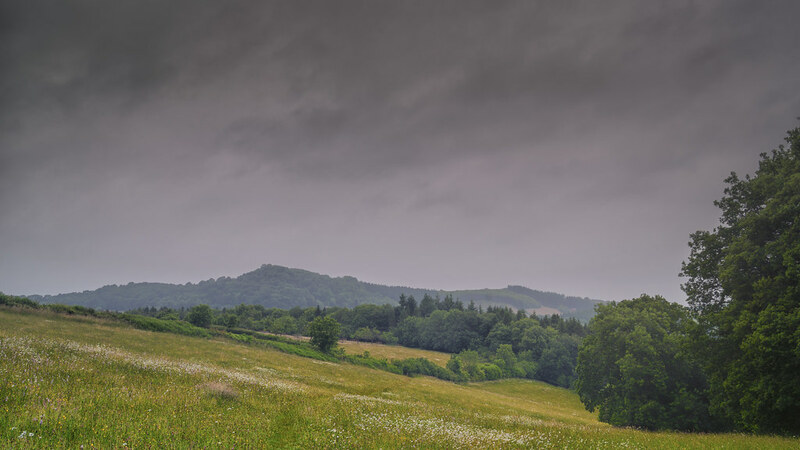 3/...Birma- Joan's Hill Farm-"Summer Showers"
Birma/Andy, our experienced forum member is almost an expert in shooting British landscape. He joins the challenge with two entries and the first one shot at Joan's Hill Farm is called "Summer Showers". "Summer Showers" is shot from the sidelines of a hillside, displaying the prevailing slope of green vegetation. The geological features in the distance (grids 3-4), namely the range of highlands which seem to extend to the right and left of the photo frame, maybe proof that there's a wider, deeper land formation which accommodates this hillside but we can't figure that out from this photo. A better vantage point to shoot may have been from the top of the hill to the left, and maybe then we could see what lies behind the trees to the right. The bigger tree, which is cut in half, is taking away from precious photo frame; if the tree has to stay, then a wider angle that includes the big tree would have been better. I loved how the trees and the vegetation reach up and out to the upper side of the hill as though tentacles. This adds depth and helps with the layering: the foreground is grassland with flowers, and gradually as we proceed up the frame, the vegetation is introduced which gets darker with the grey, overcast sky. The rainy sky and grey clouds are the 3rd layer to complete the image. The photo is good, but I feel that Birma could have done much better with the photography of this particular place, by giving it a wider shot from a higher place hence richening 'the valley look'. Right now, as the viewer, we don't know what we might be missing behind all those green and beautiful trees. Lovely contribution, Birma. Thank you very much. 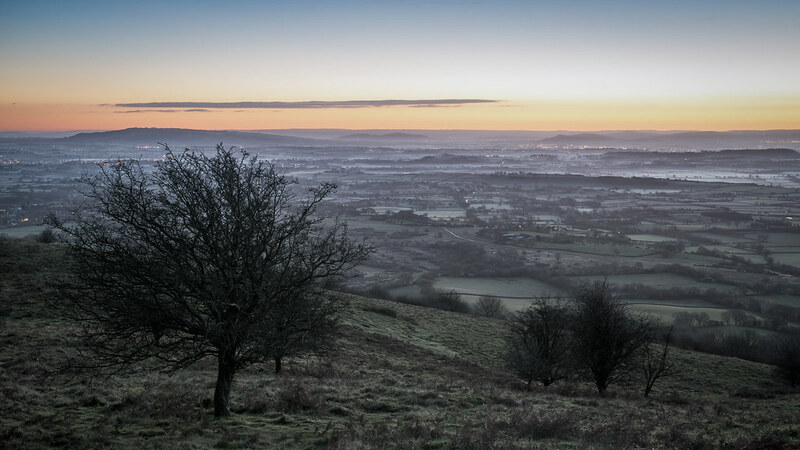 4/...Birma- 2014 Malverns-"Edge Of Night"
As he aptly described what he was experiencing during the photo shoot, while he was taking in the many details that were about to transform the valley, this photo is about details that deserve a higher resolution and bigger photo dimensions horizontally than the forum rules allow. The applied dimensions don't do it justice. The tree on the left, although one of the most important features, catches the eye before any other feature in the photo estate. It occupies almost one half of the vertical space of the photo estate and obstructs some of the intricacies that lie in the frosty valley behind it. Although the perception of depth and layers start or exist owing to its presence, I believe the photo estate should have been increased to the right to create a more proportional and balanced look at the valley. Right now, we are forced to look at the valley through a tight, square frame (2,4,6), while with additional space to the right, we could have just swept our eyes all the way to the right and breath in this majestic view. An additional amount of space to the right that's as big as the foreground tree occupies (1,3,5), would have been enough to bring on that effect....and of course, with all that wide coverage we would need the extra resolutions and dimensions to go with. Birma gives a very decent description of his photo moment. But that slate of solitary grey cloud also deserves some attention for vertically balancing the tree. Characteristic layers through Light and Colours: In its actual resolution, looking at this photo is like performing a free fall off of the hill the photographer stands on and then rolling on an eternally flat terrain that extends as far as the eyes can see. The hill, the almost flat frosty terrain and the horizon and the sky, with shades of orange and then blue contribute create at least three layers. Very nice, Birma. Thank you for your contribution. I am not sure I will survive such scrutiny. Can I withdraw my entries? mind('s eye). I am sure it is more natural for the veterans. No wonder it is taking so long. Hats off to you. sury wrote: I am not sure I will survive such scrutiny. Please don't withdraw your entries! The 'scrutiny' is no more than what we usually share in the forum threads in general. And, of course you'll survive it. You have some strong entries as far as I know...let's see how things unfold. You stood many a test of time and reviews from me and other members many times. This one will be a breeze, I promise you. Thank you for the kind thoughts. I hope the 'the thought of an invisible grid' helps with day-to-day photography as well. It's easy..very easy. Oh, no. My oversight. I forgot to put a smiley next to it. So glad to hear that. I knew you had humor on your mind.... : ) Thank you for your patience though. Life sometimes got in the way of sending the reviews sooner. It's very true that when we start analyzing photos of others or ours, to find out why we like them or not that, we also learn about our views and expectations from a photo. I decided to use an old technique of grids that painters and photographers use: the invisible grid-eye. Marcell Nikolausz joins us for a second time with his two photos taken in Switzerland with "Bohemian Switzerland". The scenes from "The Sound Of Music", the movie from 1965 with Julie Andrews and Christopher Plummer in the leading roles, came to my mind as soon as I set eyes on Marcell's second entry series. A bright sunny day in the Alps, kids roaming the thick, high, green blanket of grass and flowers, the pitched roofs of the authentic Alpine buildings showing only barely from the top of a hill. Only the music is missing from these pictures. 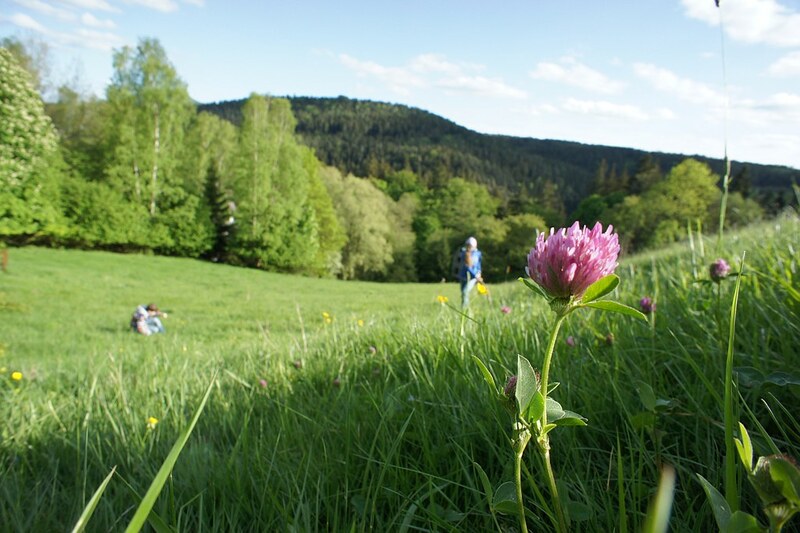 Marcell chose to go downhill and shoot uphill to give us the feel of the slopes of his Bohemian Switzerland. The big arrow which is part of the grid system is to emphasize that the photo is one-directional and missing other additional layers that show of a true valley and he almost centralized the visible pitched roof that shows over the hill. While the right of the frame is nicely occupied with grassland and trees and children, the left is free and opening up fully to the wonderful blue sky, that looks so fresh. Following from my previous reviews' footsteps, I believe going wider, both to the left and right, would have befitted the final shot. The leaves in grid (7) and grid (9) are evidence of trees on both sides and maybe including them in the shot would have worked too. Characteristic Layers: There are mainly two layers to the photo: the green hill and the blue vast sky. Being one-directional keeps the story of the photo under restrictive conditions and although it's a beautiful hillside, we cannot visualize the valley that comprises this hillside. Still though, it is a photo that writes its own rules and tells its own story and anyone looking at the photo will know that, it's a photo of love, adoration, appreciation of beauty and an attempt at trying to contain that beauty. No matter what this challenge title asked for, Marcell, this is a photo taken with your heart in it and it's valuable for that alone. Thank you very much for your contribution. Much appreciated. 6/...Marcell Nicolausz- "Bohemian Switzerland-Mountain Flower"
Marcell Nicolausz continues to give us a taste of being on the rich greens of his "Bohemian Switzerland"
with pink-purple wild flowers as an extra measure. This is my favourite of his 3 entries. It actually gives us an idea of what his valley looks like, how the valley extends and expands up into the woods of the heights in the distance. He has gone low, down into the grass to shoot this shot (grid 2), and by doing so provided us with a section of the inclined hillside to the right. We can view the full smooth valley curve. Although Marcell points out that the background blur was intentionally done to keep the children out of focus, I believe that a photo with a view to gorgeous woods, with many types of trees and bright blue sky deserves a fully sharp, in-focus take. Increased depth of field would have looked spectacular. There are only two grid lines intersecting to divide the photo estate into four segments. Some significant features are in grids (1,3) where the tall trees hide the hills in the distance, while grids (2,4) show the incline of the hill to the right and has the fully extended view of the valley right into the hill in the distance. Apart from the required sharpness, I enjoyed the way the frame was used efficiently. By the way, this is one of those places that deserve a wider shot to increase the visual impact of the beautiful landscape. A little more additional estate both to the right and to the left will give it what it deserves. Photo Estate Usage Efficiency: There's a balance in the photo; negative spaces are balanced by positive spaces full of beautiful features. The photo features several layers of land formations and colours that makes it a 3-dimensional photoscape visually. Thank you for your lovely contribution, Marcell. want to practice the technique, that I have set aside my LL for that Zeiss 135/1.8 for now.